Several photos were recently uncovered from Gus Dobyns’ estate that were in a folder labeled “GP10 Trial – 1977”. You might remember from the “revised history” of the OC&E documented in the November 2010 through the March 2011 issues of this newsletter (available on the museum website), that Gus had obtained ownership of the railroad in the 1920’s and ran it for many years. No other description of the photos was found. This was puzzling for OC&E historians as no other records had ever indicated that the railroad had a GP10. Several “old heads” were visited and they also had no recollection of any units that might have been leased or borrowed during that time. After several months of chasing down leads, the story began to unfold. Because there were apparently no official records retained by the railroad, there is a suspicion that something wasn’t completely on the “up and up.” What follows is purely speculation, but given what is now known, is highly probable. Electro Motive Division (EMD) GP9s were originally built between 1954 and 1959 and by the 1970’s most were worn out. The Illinois Central Railroad had dieselized relatively late compared to most railroads, so the majority of their diesels were GP9s. The railroad didn’t have a lot of money to invest in an all new locomotive fleet, so they decided to rebuild their GP9s to newer specifications. 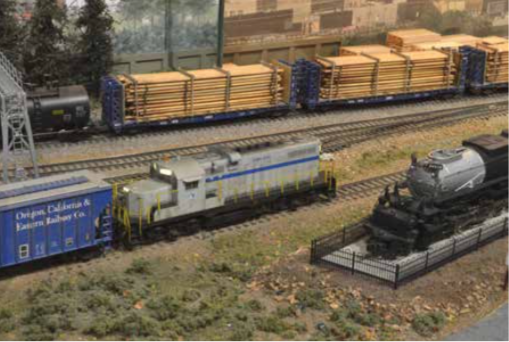 ADMX 0700 switches the Lakeview Yard. We believe this locomotive was originally the Southern Pacific 5837, although official Internet sources report this unit had been rebuilt as the IC 8107. The Illinois Central Railroad (and its successor, the Illinois Central Gulf) began rebuilding their worn out GP9s at their Paducah, Kentucky shops in the early 1970’s. 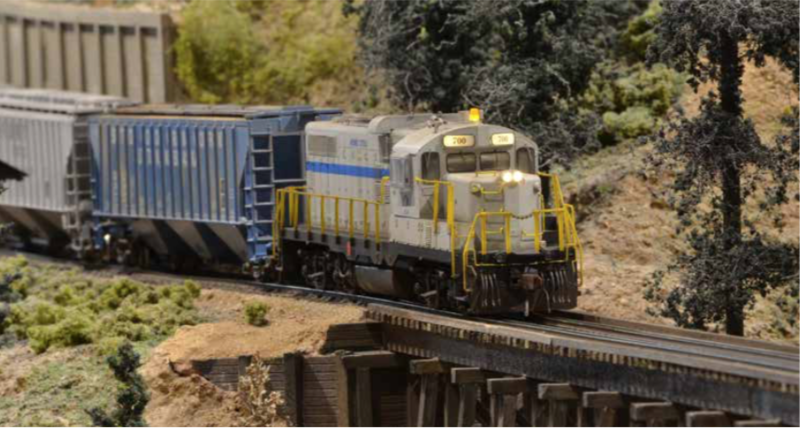 Usually, the high short hood of the GP9 was chopped for better visibility, a new air cleaner system was installed, and the diesel engine was upgraded to 1800 HP. Later on, they would purchase units from outside sources and sell the rebuilds to other railroads and industrial customers. You may remember that the 1970’s were a time of high interest rates and high inflation. The IC wasn’t the only railroad that wanted to rebuild their locomotives; several others had expressed interest but lacked the resources to do the work themselves. At the time, the OC&E’s shop crews in Lakeview and Klamath Falls were experiencing a lull in activity. The majority of the through OC&E trains were “run-throughs” using locomotives from connecting roads and rarely needed work performed by the OC&E. The OC&E owned several GP40s and U18Bs for local service, and these were still fairly new and didn’t require much maintenance. The Road Foreman of Engines, Dave Cimbura, called the U18Bs “Model T’s” because they sounded like his Grandpa’s 1925 Model T. They weren’t requiring much maintenance, and the crews liked to use them for switching. Gus Dobyns was concerned about the idle shops and came up with a brilliant idea, at least so he thought. Maybe his shop crews could earn some extra money for the railroad by rebuilding GP9s in the railroad’s shops. Now the story gets a little murky. 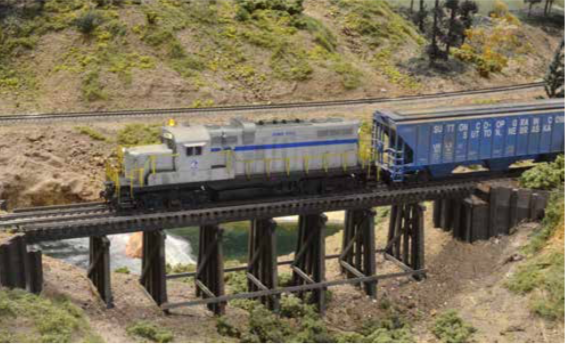 As we know, the OC&E never had any of their own 1st generations EMD locomotives. Neighbor SP had a large number that they were considering rebuilding, but hadn’t completely decided how they would do that. Gus was trying to work out a deal where the OC&E crews would perform the work for the SP. One day an SP GP9 was set out at the Lakeview interchange track. The shop foreman in Lakeview immediately assumed this was a unit that SP be rebuilt. Gus had discussed the proposal with the shop crews on both ends of the railroad, so it was naturally assumed he had negotiated a deal to start the work. It just so happened Gus had taken one of his rare vacations to go visit his daughter in Michigan’s Upper Peninsula. In the time before cell phones, business executives could actually disappear for a while and let their subordinates make all the decisions for once. The shop crews in Lakeview quickly got to work on the overhaul. They chopped the nose, upgraded the locomotive’s prime mover, and gave the engine a coat of gray primer paint. It was almost identical to the units rebuilt in Paducah. Once Gus got back, he was immediately preoccupied with some serious business matters; a large lumber forest products company wanted to buy the railroad.